In 2001, Winston Morgan wrote the first Canadian Stage Management book. It has since been the go-to guidelines for Canadian stage managers and teaching institutions. 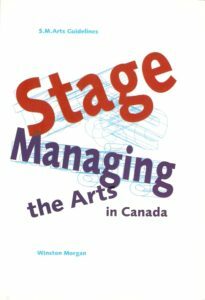 Derived out of his successful Stage Managing the Arts (SMArts) conferences, this book is the best Canadian resource for stage managers and their assistants and apprentices. Stage Managing the Arts in Canada provides a compendium of ideas, essays, checklists, cartoons, resources and everything you need to know to accomplish your day to day and week to week activities as production develops. Delve into the intricacies of a production as it unfolds from before preparation week to final performance. Explore the specifics of: Musicals, Touring for Young Audiences, Special Events, Assistant Stage Managing, Apprenticing, Reading Music, Repertory Theatre, and Stage Management Forms. Books can be ordered through Scholarly Books Services Inc. They offer a 20% discount for orders from individuals accompanied by credit card information. Our retail discount policy is available on request. They provide order fulfillment in Canada only.